Slide a selection of beads and sequins onto silver head pins. 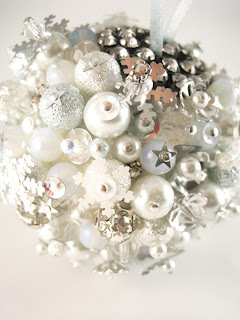 Change the embellishment combinations on each pin to create extra interest. 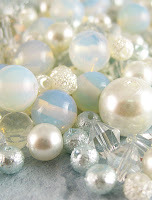 Ensure that you create some smaller bead combinations to fill in the gaps. Try and keep the tones and colours similar for an overall sophisticated look. 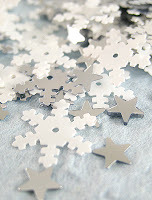 I have chosen mainly ice blues and whites with hints of silver from the crystal diamanté and snowflake sequins. 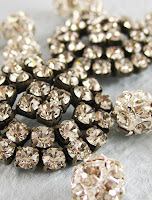 For the diamanté centrepiece simply use one half of the diamanté crystal clasp JR04869. Loop 3mm ribbon around the centre and hide the knot behind the base. Spot a little bit of glue on the shank back and using a polystyrene ball as the base, sink it into the polystyrene surface of the ball. 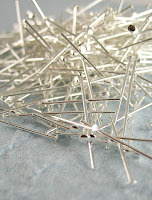 Now, simply push the decorated beaded head pins securely into the remaining surface area. For added security, spot a little glue on the bottom bead of each pin. a felt tip pen and follow as a guide.